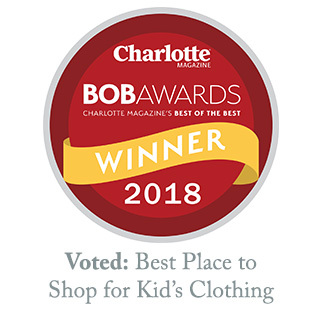 Fancy Pants Voted by Charlotte Magazine as "2018 Best Place to Shop for Kid's Clothing"
We are thrilled to share that readers nominated and voted Fancy Pants as the Best Place to Shop for Kid's Clothing in the 2018 Best-of-the-Best "BOB" awards in Charlotte. "All year long, Charlotte magazine's staff of editors and writers scour the city for the best of the best—from dining to nightlife to culture to shopping, from pampering to pets to parks. We also ask you to vote for your favorites—which you do by the tens of thousands. Then, each May, we present the BOB Awards, recognizing Charlotte's Best of the Best. Every winner since 2011—Editor's Picks and Voters' Choice—is listed in this database, which is easily searchable. Consider this your ultimate guide to Charlotte's Best of the Best." Fancy Pants has previously won this award in 2014 and 2015. Thank you again for you support! If you’re getting ready for holiday pictures, come in and we’ll help you find the perfect outfit for the all those cards you’ll be sending out. From dressy to casual, you’ll find Bella Bliss, Florence Eiseman, Claire and Charlie, and Johnnie O, Southern Tide and many more popular labels for the girls and boys. With it getting cooler, while you’re in, pick up a jacket, sweater, fleece pajamas and other seasonal items they’ll need and wear for the months ahead. We make shopping for your kids fun. We’re here to help you solve wardrobe issues and problems that are bound to come up in the life of any child. We are seeing a lot of blue, navy and pink this year, even for fall and winter. We love it and you will, too! Orders come in weekly from The Proper Peony, Beaufort Bonnet Company along with other favorites, and we’d love to show you the newest arrivals as well as items exclusive to Fancy Pants whenever you visit our store. We’re thankful this season for the relationships we’ve built with people like you who enjoy beautiful clothing, and who appreciate how the right outfit on your child can transform a frown into a smile. We care about you, your family, and are grateful to know you. We wish you the very best of the season! Tailgating, pumpkin picking, corn mazes—it’s all about Fall fun for the whole family!! It seems we all have fallen in love with fall. And why not? College football and high school sports, going to the pumpkin patch, fall festivals, corn mazes, county fairs, and more fill our September with so much goodness. Fall festivities seem tailor made for the whole family. Outfit your littles in adorable pumpkin smocked dresses and coveralls for the occasion, pile everyone in the car, and you’ll create memories to cherish long after the last leaf has fallen. Stop by our store and get the whole family in team spirit with a special “good luck” college tee to wear on all of your team’s game days, or cheerleading outfits that make them feel a part of the celebration. Tailgate for the big game by keeping the food simple and family friendly, serving hot dogs and sandwiches along with healthy apple slices and whole grain mini muffins. Pack a separate “kids’ cooler' with bottled water, juice and other kid-friendly drinks. Bring plenty to play with such as foam balls and soft gliders. And everyone enjoys corn hole games! Still not ready for traditional fall colors? That’s okay, because we are seeing and have stocked plenty of alternative hues this season, such as pink and navy, light blues, grays, and purples. From dresses to tunics and leggings for the girls, button down and polo shirts for the boys, we can help you pick out an outfit for school pictures, holiday photo shoots or portrait sittings, too. September is always packed with things to do and family fun. Stock up for it now so that whether you’re getting them ready for game day or picture day, each event will go more smoothly with what they need already waiting in their closet. Ready, set — back to school! As hard as it is to believe, it’s that time of year again. Time to think about and start shopping for back to school! That means it’s a perfect time to drop by and see our fabulous new finds from Bella Bliss, The Proper Peony, Johnnie-O, Beaufort Bonnet Company, Splendid, Ella Moss and more. Get your children’s whole school wardrobe with one stop, and go home with clothes and outfits you know will last and look good for the entire season. We have everything from shorts and polos for the boys to jumpers and denim dresses for the girls. Also, mark your calendar for August 15-17 when the Bella Bliss Fall Trunk Show comes to Fancy Pants. Bella Bliss will bring their entire fall line ready to try on and order on the spot. It’s an exciting way to rev up to the start of school and to get them started off on the right foot. Check out these other back to school events from our friends at Charlotte Parent, too! We know you treasure the last few weeks of summer… so enjoy!! Unique, fun gifts to make it a very happy birthday. It’s their special day. And even with a dozen or so birthday parties on your calendar this summer, you still want to give that birthday girl or boy something fun to keep long after the cake is gone. You’ll find a big selection of unique and thoughtful gifts at Fancy Pants—something they’ll love and you’ll love to give them. Beautiful Rosalina dolls, tea sets in a picnic basket, wooden toys, trucks, police cars and tractors make wonderful gifts they’ll treasure for years to come. There are soft books for baby’s first birthday, and Jellycats with go-along books in many different animals and sizes, sure to be the hit of the party. For the bigger kids, how about just-right-for-their-age fashion jewelry, hair bows and other accessories? All the young dudes will appreciate a cool baseball cap, bowtie, sunglasses or fidget spinners. You could also choose from our selection of fun summer pajamas, shorts, T-shirts and swimsuits to make sure they finish out the season in style. Some of these items are now on sale at 50% off! Once you’ve chosen the perfect gift, we’ll wrap it for you in a cute package that transports easily to a party across the street or across the country. Looking for a specific gift item? Call and we’ll let you know if we have it, and if not, some great options right in our convenient location. Not sure what to get? Bring the birthday boy or girl in to choose their gift in person, or opt for a Fancy Pants gift certificate. There’s nothing like seeing and finding exactly what you want in person. You’ll enjoy shopping in our pleasant and fun environment and being assisted by our friendly staff. We’ll help you find a gift that reflects your thoughtfulness, and gives them a birthday memory to last a lifetime. Making those special homecomings extra special. The birth of a child is such a special time. Here at Fancy Pants, one of our favorite things to do is to help you select the perfect layette, diaper set, or homecoming outfit for your precious little one. We can show you some of the softest, sweetest things you’ll ever find. Baby sacks, convertible gowns and footies by Baby Threads, the finest pima cotton made. Diaper sets from Auraluz, with embroidered sailboats, fishies and flowers in shades of baby blue and pink. Our baby registry is designed to make it easy for friends and family to know exactly what the parents-to-be want and need. We can even take orders over the phone and have gifts beautifully wrapped and delivered. But you don’t want to miss out on feeling how cuddly our newborn plush toys are, or how snuggly a hooded towel will feel on their sweet little heads. Come in and let us show you our special newborn selections, and help you personally choose the perfect gift to welcome that new baby home. No pick. No fade. No stretch. No worries. It’s time to jump in again—the pool, that is—and your children no doubt have outgrown that swim suit that’s tucked in the drawer, still stuck in a gym bag or that maybe never made it out of the suitcase after last year’s vacation or trip to see the grandparents. And, we know and understand how much you want to go shopping one time, for maybe two suits, get a great fit with great quality, and be done with it for the summer. Make it a fun outing and bring them in to Fancy Pants. We welcome your children, and when swimwear shopping, it’s just the best way to get the right suit with the right fit, avoiding those dreaded tugs and sags as they walk (don’t run!) across the pool deck or beach. We have quality swimwear from the labels you trust and look for. The swimwear we have in won’t pick, fade or stretch and will look great all summer long. Your young ones will really love the colors, prints, patterns and styles we have in stock now—you’ll really love the quality and selection. Girls’ and boys’: Coordinated looks from Toobydo™. Boys’ swim trunks and rash shirts: Tooybydo™, Snapper Rock™, Bailey Boys™, Funtasia™, Wes & Willy™, Johnnie O™. Sunglasses. From Teeny Tiny® Optics, designed for little faces to protect, stay on and look super cool. Sandals and flip-flops: At the Shoe Zoo inside our store. Our girls’ one-piece, two-piece and tankini suits can be coordinated so that sisters can express their own style while keeping that go-together look moms and grandmothers love. Our boys’ trunks come in dude-friendly patterns and fabric—even seersucker! Some of the selections include a no-ride liner that goes all the way down the leg and is sewn in the hem of the short. We’ll help you navigate the waters of finding the best swimwear for lessons, the pool, the beach, lake or resort. We’re here to make sure everyone is happy with one of the most important parts of their summer wardrobe—swimwear! So c’mon in. The water’s fine!